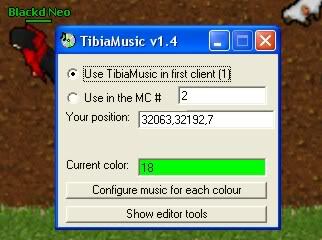 Tibia music is a program that will add music to Tibia. The music changes as you move. It is based on the colors painted on the bmps. Each color represent a game zone. Each color can get a different music. You can install it anywhere. To download Tibia Music, browse to the free tools page or click here.